Sie haben eine Frage zum Silverstar Apartment @ Greenhill Resort? Das Silverstar Apartment @ Greenhill Resort ist dank seiner qualitativ hochwertigen Räumlichkeiten bei Geschäftsreisenden und Urlaubern gleichermaßen beliebt, da es sich im an Sehenswürdigkeiten reichen, romantik-verwöhnten, naturnahen Bereich von Cameron Highlands befindet. Von hier holen Sie das Beste aus Ihrem Aufenthalt und aus dieser lebhaften Stadt heraus. Ein weiterer Pluspunkt der Unterkunft ist ihre Nähe zu den zahllosen Attraktionen und Sehenswürdigkeiten der Stadt, wie Kapelle Unserer Lieben Frau auf dem Berge Karmel, Cameron Highlands Tea Field Observatorium, Tanah Rata und einige mehr. Die Unterkunft scheut keinen Aufwand, es den Gästen so bequem wie möglich zu machen. Die Dienstleistungen und Einrichtungen der Unterkunft gehören zu den klassenbesten. Die Unterkunft bietet Zugang zu zahlreichen Dienstleistungen, einschließlich 24h-Sicherheitsdienst, tägliche Reinigung, Parkmöglichkeiten, Zimmerservice, Familienzimmer und mehr. Betreten Sie eines der 4 einladenden Zimmer und entfliehen Sie dem stressigen Alltag mit Ausstattungen wie Flachbild-TV, Schreibtisch, Fernseher, Kabelfernsehen, Kochnische und weiteren Annehmlichkeiten. Den ganzen Tag über können Sie die entspannte Atmosphäre der folgenden Einrichtungen genießen: Garten. Im Silverstar Apartment @ Greenhill Resort genießen Sie nicht nur unvergleichlichen Service, sondern logieren gleichzeitig auch noch an einer renommierten Adresse. Bitte beachten Sie, dass es in dieser Unterkunft keine Rezeption gibt. Die Zimmerschlüssel müssen im Partnerhotel abgeholt werden. Bitte kontaktieren Sie die Unterkunft für weitere Informationen. Bitte beachten Sie, dass diese Unterkunft unabhängig von einem Einzeleigentümer betrieben wird. Es ist eine private Einheit eines Ferienhauses und verfügt daher nicht über einen Check-in-Schalter. Der Eigentümer arrangiert eine „Begrüßung“ für die Schlüsselübergabe und die Vertrautmachung mit der Unterkunft. Gäste haben Zugriff auf die Kontaktdetails des Eigentümers bei Fragen zur Unterkunft. very clean and superb facilities provided.very near to go to tanah rata town and easy to find food.we are really enjoying stayed here and definitely would come here again.For those who have big family,i would advice to stay here because it is really worth for money. It's a great place to stay, the only shortcoming is transportation, other than this, everything just wonderful.. great atmosphere, fresh air, nice view, peace in mind, and the place is clean n cheap too.. owner is so kind, fetch us from here n there..
this is a nice and clean apartment. there's 3 very large bedrooms with good quality beds, and there's astro too! we have a pleasant stay here and my family member like it so much. one thing to note about the lift was breakdown during our stay, this is so tiring because we stay at 4th floor, not easy especially with children and older family members. Spacious. Relax. Value for money. We were having the trip to cameron highland to have a brief escape from the hazzy weather in our hometown Penang. Basically this is an apartment with three rooms and kitchen. We cant complain much as the facilities is up to par. Each room has a bed and one room with attached bathroom. Location of this apartment is in tanah rata. It is not a problem for us as we are driving there. It is quite a distance to the attraction points and need to go through thr heavy traffic when heading to brinchang. Overall our stay is pleasant and recommended to group traveling. This is a residency area, which is mix carpark and you stay at people resident like Homestay.. Been looking for the place for almost 10 mins, call and calling their reception.. not answering.. finally found the location and house, but staff did not attend for key or open the locked door... Another half an hour for this.. been wasting time for the trip.. After this part, everything is cool! Room is clean, nice bed and bathroom heaters is working! Slightly open the window for cold and fresh air is good :) Travel to town is not far, about 10 mins++ For night market remember park inside paid parking avoid you making at least 3 rounds for car place! Location-it is convenient if you have car. Environment-it is quiet and cold enough without fan. Room-it can fix max 8 peoples with big space and the beds are comfortable. Although I saw some dirt on the pillow but it didn't affect my mood. The house is nice and the room is big. There is very cold especially night and morning. It is near to the night market also if you have car. About the food, we brought our dinnerware and rice cooker for our steamboat to avoid the apartment did not supply. Everything was going well. Just it is quite expensive that was rm400 for a room. Just nice. This is an apartment which conducted by personal / owner. Very strict during check in time. In the end, I was be able check in at around 3pm. Not too valuable for money if compare with the facilities it has. Agoda should not promote this type of hotel because it should service like a hotel. It's clean, spacious and suitable for family with young children. 3 bedroom apartment come with 3 double bed and 2 single bed. Occasionally there are smell blown into the apartment, likely due to apartment situated beside sewage. My apartment's master-room is facing Heritage, so it's wonderful but for the other 2 bedroom it's window has to be closed due to urine smell and near corridor, especially sleep time, in case people climb in (no full window grill). The shower at the kitchen is almost trickling and water freezing when the other bathroom is in use. It's a good thing their check-in/out is hassle free. Apartment surroundings can be a little intimidating with rubbish piled up at the lift area but once inside apartment it is clean. The bed linen smelled though as if unchanged for some time. I has a wonderful stay at Silverstar Apartment . The room were great, especially the cleanliness and promptness of house keeping and maintenance and nice bedded and furniture. 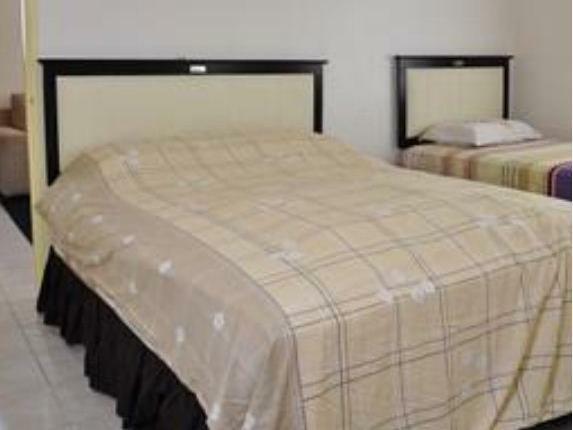 Extra large bed in a spacious room are very valuable for money that we paid.Wish to come and stay here again. The location is at Tanah Rata, but a bit far from Brinchang. suitable for family travelers with kids. The apartment was nice, bedroom & apartment was clean up. Since its cold up in the highlands, we would expect to have a water heater when we shower. Yes, there was a heater but it was spoilt, so literally we all froze in the shower. very clean, nice palce, cosy. Very suitable for family vacay. feel like home. U can bring your own Astro Card, they provide astro but only basic channel, that shud b ok. Love it soooo much!! recomended! Its greats! The apartment hotel is really nice and valueable! The hotel is clean and comfortable enough for the travel. The area of the apartment is also big enough for whole family to stay. Its really worth with the money i pay!And the most important thing is i can enjoy 10% discount and free additional vegetables when i dine in the restaurant for my steamboat dinner! Beautiful and big room, the place is nice and clean, furniture are new and good interior. Nice location and distance to pasar malam about 5 minutes. Overall is good but only the lift is many rubbish, dirty and smelly. neat, tidy and most importantly clean..
Was promised a 1st floor apartment, but got a 4th floor one instead. Turned out to be a blessing in disguise as we were greeted with a decent view. Elevators were clean and working well, but some morons decided to leave their leaky trash bags in it which was unpleasant but was of no fault of the Silverstar management. We didn't realise that the Greenhills apartment complex runs under different management, so the absence of signage made it hard to find. It was a pleasant stay overall. Luckily we stayed in Tanah Rata as there was traffic gridlock both up in Brinchang and Tringkap due to the school holodaymakers. this trips is with my family father, mother, my wife & my 2 son, 1 2yrs ++ & 6mths old ,my grandmon , my uncle & his wife, i have call the apartment office ask arrangement for the 1st floor unit, the location is easy to find, the apartment is clean & tidy,got water heater in bathroom & refrigerators in kithen as well; the kitchen toilet door is not well, is family home felling got 32" lcd tv & astro there, inside got 3 rooms,master room & 2 other rooms (the windows outside is the apartment corridor.) during night & late night time you will find a bit noisy because this 2 rooms windows is facing the corridor, sometimes children shouting & "bang" the room, if you got infant or small children better stay in master room which is better. pretty good hotel to stay, the place is clean, things are new and able to use. great location which is nearby tanah rata town. all rooms are big enough for 8 pax. but the only thing not nice was the lift is out of service and we have to climb up to 4th floor (the unit), it is quite difficult for our parents. this is the 2nd apartment which i stay in Cameron, although the location seem a bit far for me as most activities will have in brinchang but still acceptable with car. it have a nice environment, good for relaxation and with new furniture. comfort n clean!